The history of sports is filled with examples of individuals and teams going against heavily favored opponents and scoring spectacular upsets. Who can forget Doug Flutie's miracle pass against Miami, or the 1980 U.S. Hockey team upsetting the overwhelming favorite team from Russia? A few years ago, a team of relatively unknown golfers from across Europe beat a supposedly invincible U.S. Ryder Cup team. Every year athletes overcome incredible odds to become victorious. It starts with a positive mental attitude, a belief that on any given day you can win. It continues through extensive preparation, both physical and mental, which culminates in putting it all together on the day of the game. Going into a competition as the underdog places even greater importance on athletes or teams mental preparation. If you have a disadvantage physically or in terms of talent, it is imperative that you get the edge mentally. The underdog has nothing to lose. All the pressure and expectations are on the other player or team. Therefore, it is important to teach the underdog to play relaxed and to set realistic expectations for the competition. With reduced pressure, the underdog isn't afraid to take risks and can catch the favorite off-guard. It helps to break the game down into small segments. If you can stay even for the first 50 meters or the first five minutes of play, the underdog gets a surge in confidence. If, on the other hand, the favorite doesn't pull away, his or her confidence may suffer. As coach of the underdog, look for quotes from the opposition to place on your team's bulletin board. This always provides additional motivation for your team when it has been insulted or poked fun at. Often, the underdog has the crowd cheering for them and this, too, can help an athlete or team raise their game and become a little more competitive. The 10th player on a baseball team or the 7th player on a hockey team have often propelled an athlete to the next level. Visualization is an important skill for any athlete. Seeing oneself executing an ideal performance, one in which they are successful in all aspects of their game goes a long way to boosting one's self-confidence and performance level. A coach can also show a tape of the other team in which they performed poorly or even lost. This will make the competition seem conquerable, not superhuman and invincible. Also, watching a highlight of your performance can serve as a confidence booster. Sports psychologists recognize that games are often won before they are played. Therefore, the underdog may not be as quick or strong, but they can be taught to outthink the opposition. Often an underdog can "ACT AS IF" they are the favorites and carry themselves into the competition believing that they have a good chance to win. Staying focused on what is going on at the moment is crucial. An athlete can't dwell on a previous loss or mistake, nor can they focus on what will happen in the future. As coaches, it is critical to dwell on your strengths, not the opposition. Also, focus your athletes on doing their jobs, not on winning or losing or what other players may be doing. Recognize each of your athletes' abilities to contribute and be supportive. Remember, you set the tenor for your team. Finally, keep in mind that the underdog has nothing to lose. So relax, have fun, and go all out on every play. 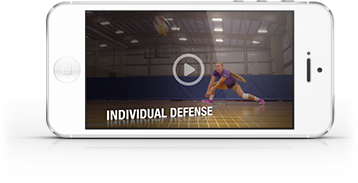 This can catch the favored opponent off-guard and lead to an upset.